Writing at The New Ledger, Francis Cianfrocca lucidly explains the precarious financial condition of the Republic. In the course of this he also provides some very useful economic history about how we got where we are. The answer to how we got here is deeply entangled with the geopolitics that emerged after the devastation of the World Wars and the Depression. One way of looking at it is that we got here because after those historic calamities, concentrated in Europe, no one was left with the credibility to anchor world finance -- no one except America. "The bottom line is that the United States exports dollars, which function as a store of value in the global trading system much as gold did in the past." Let it be noted that this settlement -- generally referred to as Bretton Woods, after the resort in New Hampshire where the victors in the Second World War met to begin the work of bringing to the ravaged world to a workable system of finance -- faciliated an expansion of wealth almost unparalleled in history. Under the operation of this settlement, both Germany and Japan were restored to a level of prosperity which would have been unthinkable to most observers at point of their ruin and subjugation after the war. Under the operation of a modified version of this settlement, China, India, and other nations in Asia have similarly witnessed an explosion of productive economic activity which has lifted countless millions out of grinding privation. And under the operation of the settlement, Americans became the richest people ever to walk the earth. The accomplishments of Bretton Woods should not be overlooked. The problem here, as I see it, is that the position of the United States as the fons et origo of the world's reserve currency, the primary "store of value in the global trading system," presented extraordinary moral and even spiritual vulnerabilities. In a word, it exposed us to Usury on a staggering scale. Since we no longer need to manufacture consumer goods (which we can import for the cost of money creation, essentially for free), we’ve turned to other bases for our industrial economy. With the rise of neoclassical economics and financial engineering, America’s most valuable business in the last two decades has been not the exportation of money, but rather the manufacture of money. The fact that Wall Street’s rocket scientists figured out how to make money out of money itself, without creating real goods and services, made it inevitable that we would have a cataclysmic crash. The temptation to curse the bankers and financiers is very strong. Unquestionably their recklessness has enervated our proud Republic in appalling ways. Nor should the Federal Reserve escape blame. The Wall Street Journal Editorial Page has been waging forensic and rhetorical war on the Fed, and Chairman Ben Bernanke in particular, for some time now, and scoring plenty of solid points. Recently released transcripts from the Fed's Open Market Committee show that even as far back as five years ago this war came into the compass of that Committee's own internal debates. The crux of the criticism is that the Federal Reserve's loose monetary policy during the brief recession that followed the dot.com crash and September 11th, unleashed upon the world financial system a flood of new money that raced off after new bubbles, above all the housing bubble and what is called shadow banking. The Fed facilitated the manufacture of money, and thus it faciliated a colossal system of usury. Yet the thing that strikes me as I study all this is a terrible sense of inevitability. Where in this chain of crises and decisions are the obvious points where normal statesmanship could have averted the disaster? When Paul Volcker, Fed Chairman in the early 1980s, showed the guts to actually provoke a deep recession in order to check the ruinous enigma known as stagflation, he had behind him the greatest statesman of our age, Ronald Reagan. What prescience and iron will would have been required to strangle shadow banking in the crib of its late-80s infancy? What sort of strength and shrewdness, not to mention humility, must Greenspan have possessed were he to have staved off the various bubbles his tenure faciliated, when virtually all the world was praising his wisdom? Can you imagine the hue and cry, had the Fed answered the shock of September 11, hard on the heels of which the stock market fell like rock, by raising interest rates? Perhaps smarter, more knowledgeable men than me will eventually identify for us the Pickett's Charge, so to speak, of this tragedy of Usury -- the moment when a few decisions taken by a few crucial men truly formed the pivot round which the world turned. Perhaps some future historian of genius will one day explain for our posterity where a decisive stroke of statesmanship would have averted this disaster. But I cannot see it. What I can see is a new crisis or pivot in the near future. Likely it will be a confrontation, misunderstood and poorly reported. With the economy finally starting to revive a bit, the politicians in Washington will want more money for their pet schemes, but Ben Bernanke or his successor at the Federal Reserve will perceive that more manufactured money could produce the final discredit of the dollar and the bankruptcy of the Republic. He will perceive that he must stand against the politicians, and against the tides of popular socialism now rolling over us, and refuse them and their constituencies the money they want. Let us hope that we have more than normal statesmanship when this confrontation comes. Mr. Cianfrocca ends on an unexpectantly hopeful note, but what he hints at is obscure. Perhaps it lies in his sense of the power of necessity to discipline excess. In any case, it is doubtful that we can hide from necessity's discipline much longer. With the rise of neoclassical economics and financial engineering, America’s most valuable business in the last two decades has been not the exportation of money, but rather the manufacture of money. The fact that Wall Street’s rocket scientists figured out how to make money out of money itself, without creating real goods and services, made it inevitable that we would have a cataclysmic crash. The trouble with so much of the talk - and idle talk it is - of spiritual renewal in America, and of its prospects, is that it tends to assume a quietist, therapeutic form; that is, the prospective spiritual renewal will enable the newly illumined masses to better accommodate themselves to the established architecture of the system, by - in this instance - reverting to earlier practices of financial providence, never to interrogate the entrenched structures of usury and rank financial conjuration. A sort of "personally opposed, but...." approach to political economy. But if that spiritual renewal does not lead to a questioning of the political and economic centralization of which our financial system is representative, then we may say of it what is said of faith without works. When America was an emergent industrial power, she relied upon the tariff, and other protectionist measures. When America became a global colossus, issuer of the world's reserve currency, she relied upon free trade. And as America emerged as a global center of financial engineering, ie. 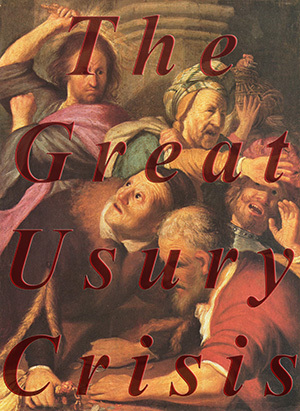 usury, she implemented policies designed to secure the interests of the finance capitalists. There is a constant in the history of American political economy, a constant lurking below the surface questions concerning which economic sectors achieve prominence in given periods, and it is considerably more complicated than the little just-so stories that conservatives like to console themselves with. Well...well...well...then _obviously_ the worst _possible_ thing we could be doing right now is printing more and more money to try to get ourselves out of the present crisis, right? I mean, sheesh. It sounds to me like everybody is screaming that we need sound money while being unwilling to condemn our recent further moves away from anything remotely like sound money. There can be no possibility of "sound money" absent a sound financial system, which is to say, one not characterized by absurd degrees of centralization, nor reliant upon usury and economic occultism for its profits, nor yet locked in an incestuous embrace with political power. A first step towards such a system might have been to take these institutions deemed "too big to fail" into some form of public receivership, break them up into tiny components, resell those constituent parts, thus beginning to shatter the power of the financial establishment, which received the very government, and governance, that it purchased for itself - and precipitated a crisis. None of that, obviously, has been contemplated, outside the blogosphere, and so I've had nothing to applaud since last August, other than the bare formal fact that the government did not adopt a Hooverist, liquidationist posture. But the devil lieth in the details, and the details have been all wrong. It looks like the receivership, break-up, resale model is beginning to work, after a fashion, with AIG. Wow! I wasn't suggesting a more soothing opiate for the masses, but hoping that a Christological view of what it means to be human and an incarnational view of reality would take hold. Without such a transformation I see no escaping our destiny as serfs within The Servile State. Benedict XVI's soon to released encycylical should elaborate on this need and look forward to your post after you have read it. No need to further mythologize RR. Volcker had the luxury of 20% short term rates with which to work instead of the liquidity trap associated with the present crisis. Compensation based on stock price should be illegal and compensation above a modest amount based on mark to market should be taxed at somewhere between 90 and 100%. Remove the incentives and eliminate the problem. To add to Al's comment, I'd suggest that financial sector compensation predicated upon the nominal, book value of trades, ie., anticipated future returns, should be illegal. No one should receive any compensation for saying, in effect, that 10 years down the road, the company and investors will receive some payout for the things I did today, so I deserve the keys to the kingdom of mammon. Wow! I wasn't suggesting a more soothing opiate for the masses, but hoping that a Christological view of what it means to be human and an incarnational view of reality would take hold. I don't believe that you were, Kevin. I merely intended to make a comment about a species of apologetic for traditional values and religious commitment, according to which religious orthodoxy and the virtues it inculcates best uphold the bourgeois order, or even simply democratic capitalism. It is an implicit instrumentalization of religion towards the preservation of our political economy. It is far from clear that the virtues of the two are identical, if the ethos of the latter can even be deemed a tradition of virtue, and in fact they are often opposed, such that, if the religious tradition never challenges the economy, it justifiably may be regarded as dead. It's been about a century in the making, so it's doubtful that there was just one point where it could have been stopped. It began with the creation of the federal reserve, then carried over into FDR's seizure of private gold, continued with ending the gold standard, and all of the little manipulations of rates, etc. before, during and after those points. At any step of the way, Congress could have repealed the Federal Reserve Act, even if it was a phased withdrawal that would move us back to the earlier, decentralized system we had for the first half of our republic when the dollar actually increased in value, rather than losing 90 some percent of its value. Thanks for introducing me to The New Ledger, which I had missed until now. I am, initially, really impressed. In addition to this piece by Francis Cianfrocca, Dan McLaughlin's article Mark Sanford's Betrayal is dead on target, and Christopher Badeaux' takedown of Andrew Sullivan is absolutely priceless. It is an implicit instrumentalization of religion towards the preservation of our political economy. Agreed Maximos, that is a deformation of Christianity that we have to repair. And yes those religious traditions that simply mimic our current system or are too neutered to offer a critique and generate the necessary correctives have already expired. The Guardian report that Kevin linked to makes me wonder why the hoi polloi were made to run around like headless chickens last September. Then the Americans were stampeded into pumping unheard of sums of money into the financial system for otherwise Main Street would collapse. Well whatever the fate of Main Street, Wall Street seems to have done well out of the state of permanent crisis. It appears that we are in for a reprise of the bubble in a few short years. I like Cianfrocca and admired his piece for Commentary last month called “Wealth Creation Under Attack”, in which he takes aim at various goofy Obama policies related to the economy. However, I’m not so sure that Cianfrocca does justice to our current economic/financial problems in “The New Ledger” piece linked to above. While I’m glad he (and you) single out the Federal Reserve in contributing to our present woes by keeping interest rates too low, it is worth remembering that hindsight is 20/20 and it was not at all clear to many back in late 2001 or 2002 that low interest rates weren’t needed to avoid more serious economic pain as a result of 9/11. Economic growth was strong and steady in the second half of Bush’s first term and there is no doubt that low interest rates (and more generally easy money) helped contribute to that growth. It is also worth noting that the traditional enemy of the Fed is inflation, and despite our easy money policies, the Fed has done a decent job of keeping inflation low throughout the ‘oughts’. Where I think Cianfrocca grossly oversimplifies his story is in the very lines you quote: “Since we no longer need to manufacture consumer goods (which we can import for the cost of money creation, essentially for free), we’ve turned to other bases for our industrial economy. With the rise of neoclassical economics and financial engineering, America’s most valuable business in the last two decades has been not the exportation of money, but rather the manufacture of money.” It is just wrong to say the U.S. “no longer” needs to manufacture consumer goods – as I never tire of reminding liberals and paleos who don’t understand the economy, the U.S. is producing more goods and services than ever before – but we are doing it more efficiently and with less workers than ever before (at least in manufacturing…we still employ lots of folks in the information and service economies). And what does Cianfrocca mean by “America’s most valuable business in the last two decades has been…the manufacture of money”? Does he mean that those on Wall Street have made more money than those in the business of providing goods and services? I know this can’t be right as the majority of richest Americans remain those who made their money the old fashioned way – providing goods and services to other Americans (and global consumers as well). Dow Jones companies? I count only three out of thirty that focus on finance. Maybe he means that profits have been better in finance than other industries? But even if this was true (and since he uses the past two decades as his timeframe, I doubt this – just think of the Google guys as one example of high profits/high returns on investment), I doubt that it has remained true post-financial meltdown of 2008. “The hunger for more mortgages that could serve as backing for more new securities led to the acceleration of undocumented, no-down-payment, negative-amortization mortgage loans to individuals with virtually no prospect of servicing them. The designers of derivative securities effectively collaborated with the rating agencies, such as Standard & Poor’s and Moody’s, that were relied upon (often through government mandate) by pension funds and other gigantic repositories of wealth with identifying the securities safe enough to invest in. As they say on the blogosphere, read the whole thing (but on the newsstand – this article is not yet available online). As usual, I have no idea what you mean when you say something like the following: "When America was an emergent industrial power, she relied upon the tariff, and other protectionist measures. When America became a global colossus, issuer of the world's reserve currency, she relied upon free trade. And as America emerged as a global center of financial engineering, ie. usury, she implemented policies designed to secure the interests of the finance capitalists. There is a constant in the history of American political economy, a constant lurking below the surface questions concerning which economic sectors achieve prominence in given periods, and it is considerably more complicated than the little just-so stories that conservatives like to console themselves with." As a description of economic history, this is just woefully simplistic (e.g. I agree America had a tariff in the 19th Century, but this begs the question of whether or not it was useful or whether or not we "relied upon the tariff" for economic growth) and as for the "constant lurking below the surface", I guess I'd like some clarification as to what the heck you mean!? "While I’m glad he (and you) single out the Federal Reserve in contributing to our present woes by keeping interest rates too low, it is worth remembering that hindsight is 20/20 and it was not at all clear to many back in late 2001 or 2002 that low interest rates weren’t needed to avoid more serious economic pain as a result of 9/11." "What prescience and iron will would have been required to strangle shadow banking in the crib of its late-80s infancy? What sort of strength and shrewdness, not to mention humility, must Greenspan have possessed were he to have staved off the various bubbles his tenure facilitated, when virtually all the world was praising his wisdom? Can you imagine the hue and cry, had the Fed answered the shock of September 11, hard on the heels of which the stock market fell like rock, by raising interest rates?" Indeed, one of the key points of my post could be condensed into "hindsight is 20/20." Secondly, as I read the Malkin quotations you presented, I found myself nodding with increasing vigor and amusement, until at last I almost burst out aloud: "why yes! that is the manufacture of money!" While Malkin apparently focuses a good deal on the housing policy side of the problem, Francis is speaking to the securities side, to that vast web of shadow banking which grew exponentially as the wealth from the housing boom (much of it illusory) flooded into non-bank institutions, which operated by the standard banking formula of borrowing short and lending long -- only they did it outside of regulatory oversight. I have no doubt that the ratings agencies played a big role here. I probably think housing policy played a smaller role than you do, but it was hardly insignificant. To describe this whole web of manufactured money I have fixed on the dread term usury (and again let me emphasize that that word is mine not Francis's) for a variety of reasons, many of which can be found in the eponymous section of this blog, so I will not rehash them at length here. Suffice it say that the system depended on abstraction, obscurity, and a general willingness on the part of many to believe something real that is in fact unreal. Moreover (and this may be even more important) usury is a lesser offense than outright fraud; and angry as I may be at the 300 Optimists at AIG, I cannot in good conscience accuse them of deliberately defrauding people. "By early 2009, a whole series of new government operations had been invented to inject cash into the economy, most all of them completely secretive and with names you've never heard of. There is the Term Auction Facility, the Term Securities Lending Facility, the Primary Dealer Credit Facility, the Commercial Paper Funding Facility and a monster called the Asset-Backed Commercial Paper Money Market Mutual Fund Liquidity Facility (boasting the chat-room horror-show acronym ABCPMMMFLF). For good measure, there's also something called a Money Market Investor Funding Facility, plus three facilities called Maiden Lane I, II and III to aid bailout recipients like Bear Stearns and AIG. While the rest of America, and most of Congress, have been bugging out about the $700 billion bailout program called TARP, all of these newly created organisms in the Federal Reserve zoo have quietly been pumping not billions but trillions of dollars into the hands of private companies (at least $3 trillion so far in loans, with as much as $5.7 trillion more in guarantees of private investments"
Since we no longer need to manufacture consumer goods (which we can import for the cost of money creation, essentially for free), we’ve turned to other bases for our industrial economy. Huh? The manufacturing output of the United States is far higher than that of any nation save China. The country also produces vast amounts of food. There are a number of undesirable attributes of the contemporary American economy (excessive debt chief among them), but lack of production of material goods isn't one of them. I'm not familiar with this Francis Cianfrocca, but when he starts off a piece with such a profound factual error, it makes one leery of taking seriously anything he subsequently writes.